BSE Sensex closed lower by 351.56 points, or 1.05%, to 33,019.07, while the Nifty 50 fell 116.60 points, or 1.14%, to close at 10,128.40. BSE MidCap and SmallCap declined 0.92% and 1.01%, respectively. All the sectoral indices on BSE ended lower with metal, consumer durables and basic materials shedding most at over 2%. 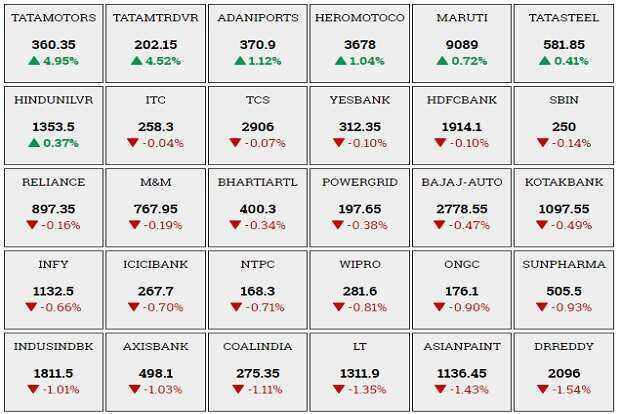 Tata Motors, Hindustan Unilever, Adani Ports and Hero MotoCorp were top gainers, whereas Tata Steel, Axis Bank, L&T and NTPC were among the major losers. BSE Sensex traded lower by 395.15 points, or 1.18%, to 32,975.48, while the Nifty 50 fell 128.65 points, or 1.26%, to 10,116.35. BSE Sensex traded lower by 283.66 points, or 0.85%, to 33,086.97, while the Nifty 50 fell 98.10 points, or 0.96%, to 10,146.90. Glenmark Pharmaceuticals Ltd said it has signed an exclusive agreement with Swiss pharmaceutical group Helsinn to introduce Akynzeo, used for prevention of chemotherapy-induced nausea and vomiting, in India and Nepal. Shares were down 0.04% at Rs549.95. Sharika Enterprises Ltd shares surged 16.87% to Rs57.50 after the company said it has received LoI for designing, supplying, installation and commissioning of solar street lighting systems worth Rs40.33 crore from a government renewable energy agency. The Indian rupee erased all the morning gains and was trading weaker against US dollar after local equity markets fell over 300 points as trade war fears escalate. At 1.55pm, the home currency was trading at 65.08 a dollar, down 0.12% from its Tuesday’s close of 65.01. The rupee opened at 64.98 a dollar and touched a high and a low of 64.91 and 65.10 respectively. The 10-year bond yield was at 7.311% compared to its previous close of 7.331%. BSE Sensex traded lower by 271.43 points, or 0.81%, to 33,099.20, while the Nifty 50 fell 87.90 points, or 0.86%, to 10,157.10. All the sectoral indices on BSE, except auto and realty, declined with consumer durables, capital goods and bankex shedding most. BSE MidCap fell 0.37% and SmallCap was down 0.51%. 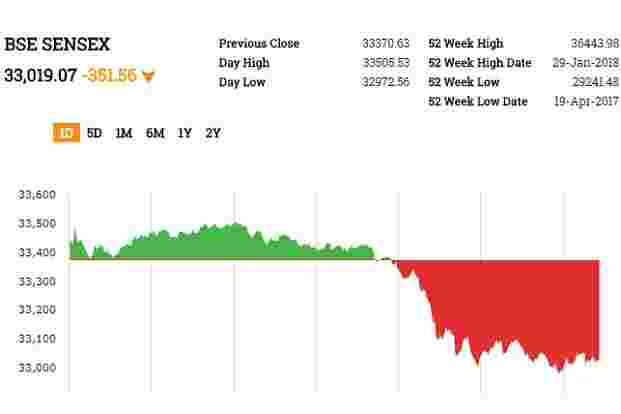 BSE Sensex traded lower by 101.24 points, or 0.30%, to 33,269.39, while the Nifty 50 fell 22 points, or 0.21%, to 10,223. Shares of speciality alloy maker Mishra Dhatu Nigam Ltd (Midhani) debuted at 3.33% discount to its issue price even after its Rs438 crore initial public offering (IPO) witnessed an overall subscription of 1.21 times last week. Midhani shares opened 3.33% lower on the BSE at Rs87 a piece , compared to the issue price of Rs90, which was the upper end of the price band between Rs87-Rs90 per share. After a tepid response to the initial public offering (IPO) of ICICI Securities Ltd, the issue saw a weak listing. Shares of the brokerage and investment banking arm of ICICI Bank Ltd were listed at Rs431.10, down 17.09% from its issue price of Rs520. At 1.13pm, ICICI Securities shares were trading at Rs449.30 on BSE, down 13.60% from its issue price. The stock hit a high and a low of Rs462.70 and Rs431.10, respectively. Eicher Motors Ltd shares jumped 3.34% to Rs28,990 after the announcement that Royal Enfield will invest Rs800 crore in FY19 as capital expenditure (capex) and is starting work on the second phase of its Vallam Vadagal plant in Tamil Nadu. Capacite Infraprojects Ltd shares gained 1.39% to Rs332.50 after the company said it has received repeat orders worth Rs365.50 crore from Oberoi Realty Group. JSW Steel Ltd shares rose 1.06% to Rs305.35 after the company reported that its March crude steel production rose 5% to 1.52 million tonnes compared to the same month last year. The company’s production for the fourth quarter also grew 5% to 4.31 million tonnes year over year. Ferro Alloys Corp Ltd shares fell 5% to Rs 7 after lenders’ panel rejected debt resolution plans. BSE Sensex traded higher by 125.55 points, or 0.38%, to 33,496.18, while the Nifty 50 gained 26.05 points, or 0.25%, to 10,271.05. BSE MidCap and SmallCap rose 0.80% and 1.13%, respectively. Among the sectoral indices on BSE, realty, auto, industrials were trading higher, while oil and gas, consumer durables and IT declined. Tata Motors, M&M, Yes Bank and Maruti Suzuki India were top gainers, whereas Dr. Reddy’s Labs, NTPC, HDFC and Coal India were among the major losers. Infibeam Incorporation Ltd shares added 3.4% to Rs164 after the company said it entered into an agreement with TV18 for advertising products, services and brands. Zensar Technologies Ltd shares gained 6% to Rs955.40 after the company said it won a multi-year contract with City of San Diego for network services, with value of order seen at about $79 million. Akzo Nobel India Ltd shares rose 5.1% to Rs1,893 after the company said its board will meet on 6 April to consider buyback. Tata Motors Ltd shares were up 2.8% at Rs352.80. Tata Sons chairman Natarajan Chandrasekaran has asked Tata Motors Ltd to create value for the group, especially from its domestic business, in line with his objective of making Tata group companies more accountable. Provisional revenues released by these companies imply that Bharat Electronics closed the previous fiscal year with a revenue growth of 13.3%, way more than the 2.2% rise reported by Hindustan Aeronautics. The Indian rupee was trading marginally higher in morning hours against US dollar on Wednesday as the Reserve Bank of India kicked off its two-day monetary policy meeting. The rupee opened at 64.98 a dollar. At 9.15am, the home currency was trading at 64.95 a dollar, up 0.10% from its Tuesday’s close of 65.01. The 10-year bond yield was at 7.341% compared to its previous close of 7.331%. Bond yields and prices move in opposite directions. BSE Sensex traded higher by 49.94 points, or 0.15%, to 33,420.57, while the Nifty 50 gained 9.05 points, or 0.09%, to 10,254.05.